Earn 9 SB per $ when you buy Lands' End gift cards at MyGiftCardsPlus, powered by Swagbucks. 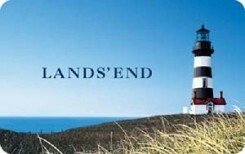 Since Lands' End began doing business in 1963, they've created clothing that sets the highest standards for enduring quality, style and value. You can order mens, womens and kids clothing (along with a line of luxurious home fashions) with confidence, because your satisfaction is Guaranteed. Period. Lands' End is not a sponsor of this promotion and is not affiliated with Swagbucks. Terms & conditions apply, see back of card for additional terms.